One of the much awaited and hyped Hollywood films of the year 2019 is Quentin Tarantino’s Once Upon a Time in Hollywood. Starring one of the biggest superstars of Hollywood, Brad Pitt and Leonardo DiCaprio, the film’s first poster was just released and features the two stars in a never-seen-before look. One of the much awaited and hyped Hollywood films of the year 2019 is Quentin Tarantino’s Once Upon a Time in Hollywood. Starring one of the biggest superstars of Hollywood, Brad Pitt and Leonardo DiCaprio, the film’s first poster was just released and features the two stars in a never-seen-before look. Looking at Brad and Leonardo in the poster, one will surely be transported back to 1969-1970s. The film has been generating a lot of buzz since it is reportedly based on the Manson Family Murders. Once Upon a Time in Hollywood will star Brad Pitt as Cliff Booth and Leonardo DiCaprio as Rick Dalton. Rick is a struggling TV actor while Cliff his close friend and stunt double. Back in 2017, Quentin announced that this will be his first film which will not be associated with Harvey Weinstein’s production house post him being accused of sexual harassment allegations. In the poster, we can see Brad dressed in a printed yellow shirt over a white tee and a pair of blue jeans. On the other hand, Leo can be seen dressed in a brown leather jacket with a brown trousers and leather shoes. The two seem to be standing on the backdrop of the iconic Hollywood sign in California and with a yellow car parked behind them. The film also stars Margot Robbie as Sharon Tate and Al Pacino as Marvin Shwarz. Luke Perry will be seen for the last time on screen in this film. 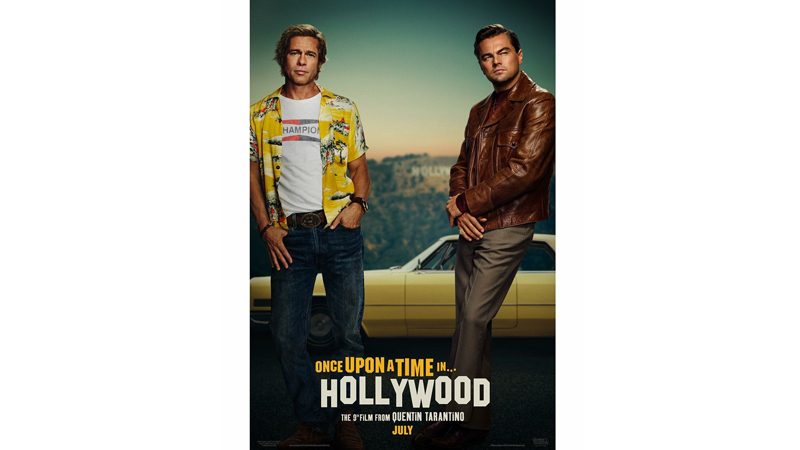 Once Upon a time in Hollywood is being produced by Columbia Pictures, Heyday Films and Bona Film Group. It is slated to release on July 26, 2019.